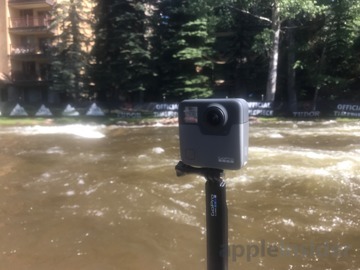 GoPro on Thursday gave AppleInsider a closer look at the company's upcoming Fusion camera, a 5.2K resolution 360-degree camera that will bring immersive virtual reality recording to the masses. 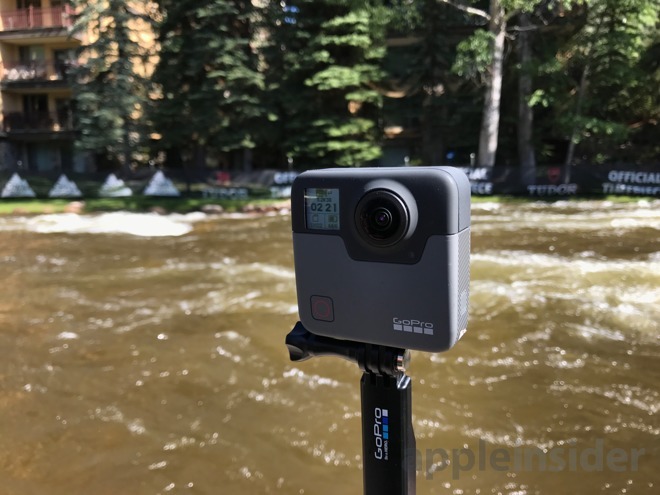 The Fusion represents GoPro's entrance into the spherical camera market, boasting all the trappings fans have come to expect from the action cam giant in a new, all-encompassing recording method. 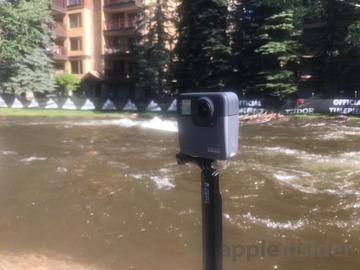 AppleInsider had the opportunity to go hands-on with the camera after we were invited to the GoPro Mountain Games event in Vail, Colo. 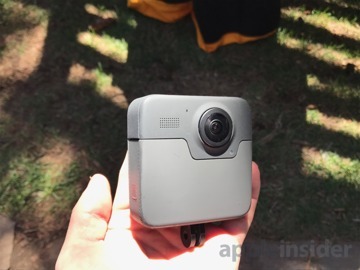 Though GoPro is keeping details close to the vest for now, it did offer media outlets a sneak peek at what consumers can expect later this year. Footage captured by the Fusion and presented on Samsung Gear VR headsets was clean and seamless. Notably, GoPro's software largely eliminated stitching between the twin lenses, and deleted any trace of unsightly mounts. While offering an immersive experience, the footage captured by the Fusion is only in two dimensions. In person, the unit is fairly compact, similar in size to an Apple AirPort Express, if a bit thinner. The two lenses, said to be the equivalent of six normal GoPro cameras, are offset on either side of the main chassis. 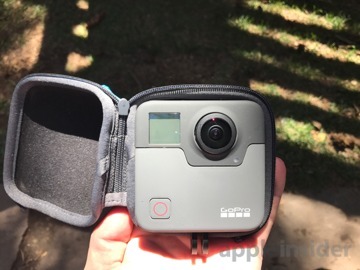 GoPro said the design serves a specific purpose, but declined to elaborate. 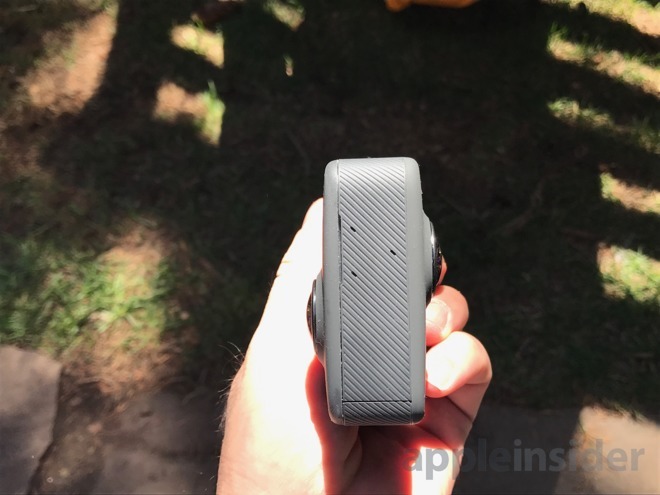 The device is being positioned as a VR/consumer hybrid, capable of capturing spherical video that can be cropped to select whatever portion of the clip a user wants, in addition to VR. Each segment of the spherical video captured can be "punched out" into its own 1080p clip, ensuring users don't miss a thing. In that way, the GoPro Fusion is seen as something of a one-stop shop for sports camera needs, capable not only of VR but also ensuring nothing is missed. The 360-degree video is captured with two lenses, one on each side of the camera. The cameras are offset on each side, making them off-axis, unlike other spherical cameras. 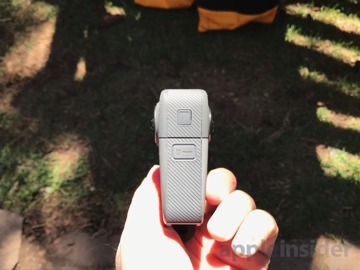 We suspect GoPro has some special design feature going on, likely to help with the software stitching. However, company officials declined to say what it is just yet. 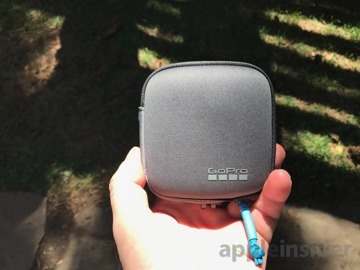 We also don't know how much it will cost, or precisely when it will ship, though GoPro pledges to launch the Fusion in some capacity before the end of this year. A pilot program will also debut before August for sports and film partners. The device will also come with special software for editing, with the goal of making it easier for the average consumer to use the footage without being familiar with 360-degree video. 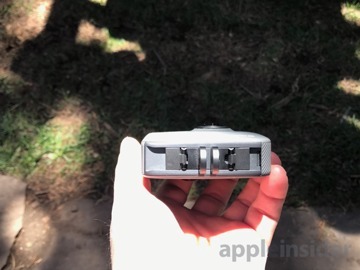 AppleInsider will have much more from the GoPro Mountain Games this week, including a closer look at what the company has in store for its iOS application and future iPhone connectivity.